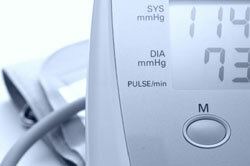 Home » Uncategorized » Blood Pressure and Hypertension: Under Pressure?! Blood Pressure and Hypertension: Under Pressure?! Comments Off on Blood Pressure and Hypertension: Under Pressure?! We all know what can happen if the water pressure to our house is too high. It can lead to damaged or busted pipes. It can also cause leaky or busted appliances – dishwasher, washing machine, refrigerator – due to the increased pressure. As soon as you realize you have high water pressure in your home, you work to get it down to a normal range as soon as possible. Why would your high blood pressure be treated any differently? 33% of Americans have no symptoms of high blood pressure, so they do not realize the damage that is occurring with every heartbeat. With an average of 100,000 heartbeats a day, your arteries get consistent high pressure 24/7 for 365 days a year. Just as there are many factors that cause hypertension, there are many treatments available as well. Only your doctor can advise you on what treatment options will work best for you. Once you and your doctor have your hypertension under control it is critical to get regular 6 month checkups to prevent relapse.